" New Central Library - St. Louis, Missouri - June 9, 1911." 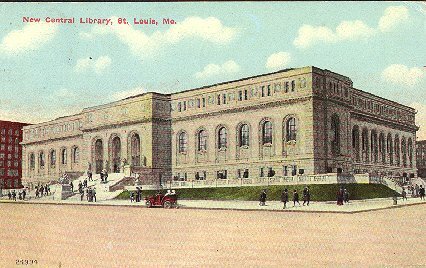 (1259) POSTCARD: New Central Library - St. Louis, Missouri - June 9, 1911. -Condition: Very Good.- Colored. Posted. Handwritten message reads: 97 degrees Sunday. Today was 95 degree in my rental____ room. I've lost all the ambition I ever had. Three or four are overcome by the heat every day. Was too warm to go to Barnam & Baileys Circus last week. Price: $4.50 + shipping.